Figure 16-8.--Construction of an ellipse. deck or bulkhead at an angle. an exact fit by using templates and targets. 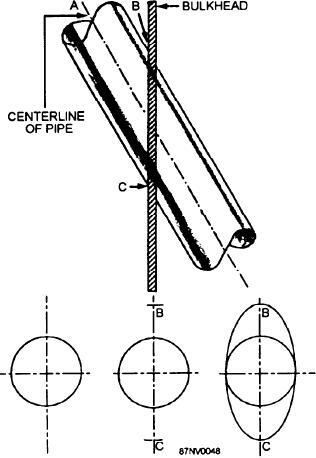 and using a template is illustrated in figure 16-10.
wooden disks to the flanges of the fixed-position pipes. to the 2 by 4. The template can now be taken to the shop. Figure 16-9.--Finding the length of an elliptical hole. and described in the following paragraphs. view D of figure 16-10.